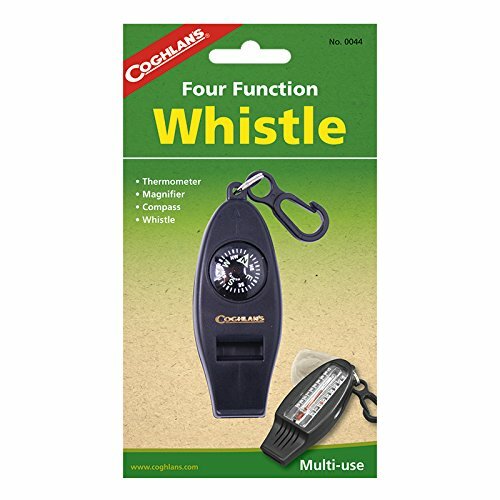 Keep yourself safe while camping or backpacking with this four-function whistle from Coghlan's, which features a magnifier, compass, and two-scale thermometer. 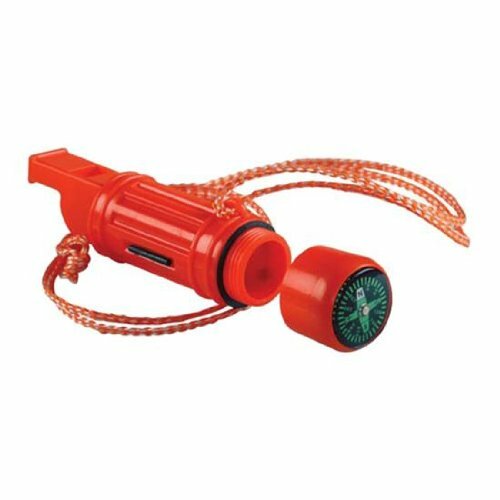 A handy tool for backcountry treks, this shrill-sounding safety whistle also has a convenient lanyard with clip. Coghlan's makes the outdoors more comfortable and enjoyable with over 450 accessories for camping, hiking, fishing, and RVing -- from cooking gear to first aid kits, insect netting, firestarters, tent repair, and more. Features: 1.Assorted colors available 2.Loud whistle, great for sporting events, camping & hiking,boating. 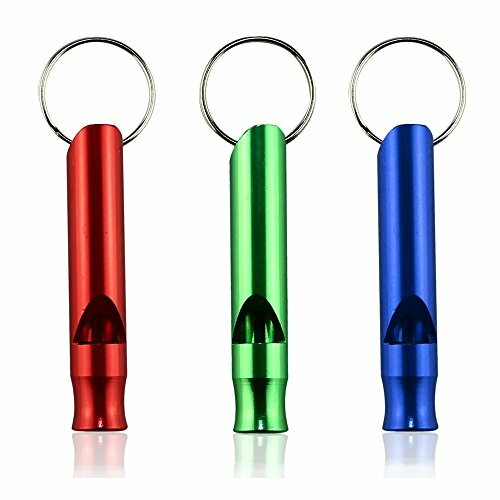 3.Length:6cm 2.36" 4.Material:Aluminum Description: 1.Loud whistle can be heard for far distance 2.Looks like little item,but potentially important one, this Emergency Whistle & Keychain could be a life-saver. 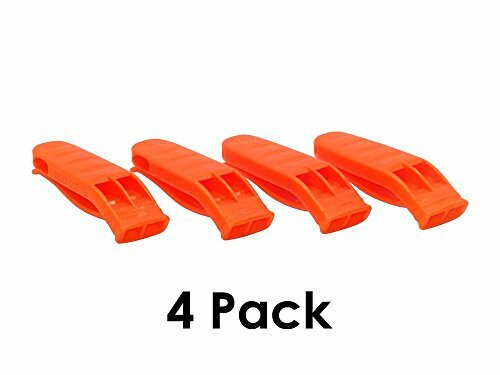 3.This tool is ideal for camping, boating, fishing, hiking and other outdoor activities 4.Brightly colored easy to find it when you need it. 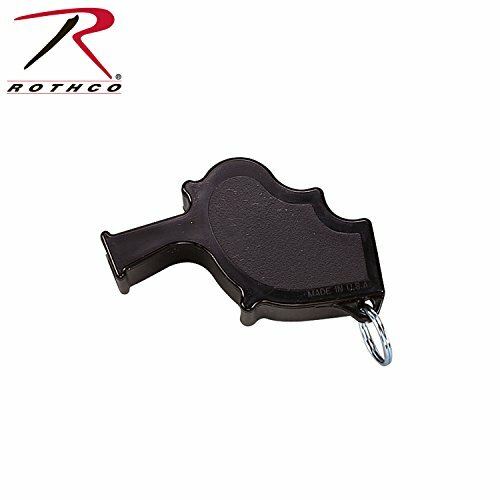 5.Key ring for attachment to a lanyard or keys. Package content: 3 x Aluminum Whistle Attention: The whistle is for Emergency Hiking Camping Survival, not a toy minimun age above 6 years old . 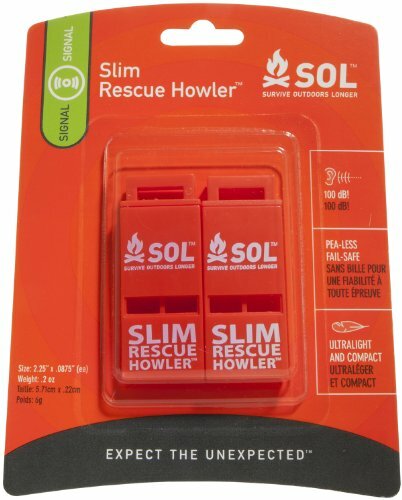 Broadcast your position when lost in the wilderness with the Survive Outdoors Longer Slim Rescue Howler Whistle. Emitting a piercing 100-decibel signal, this slim single-frequency whistle is audible from over a mile away. 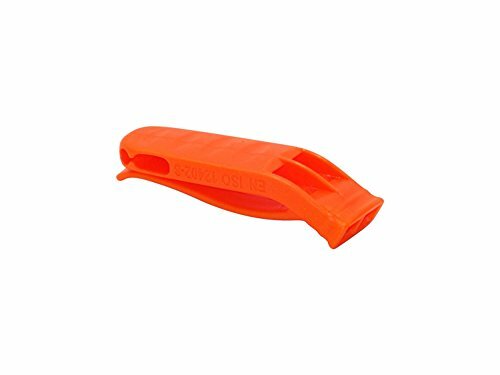 These whistles are ideal for signaling for a variety of outdoor activities, whether you are on the trail, on the slope, the water, and more. Pea-less design ensures that the whistle works in any outdoor conditions without jamming or freezing. Weighing less than an ounce, this ultra-portable whistle fits in any pocket and attaches to zipper pulls. Each pack contains two whistles to share or distribute among gear like a rain jacket or go bag. 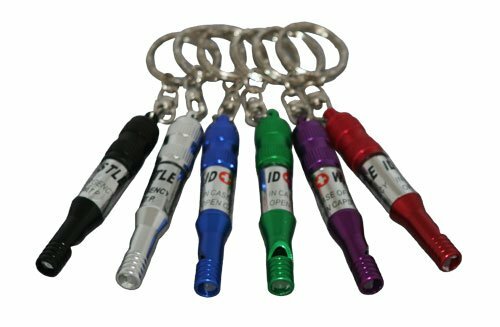 Loud Emergency Whistle with twist-off Id holder capsule, made of metal. Comes in a variety of colors including: black, silver, blue, green, purple, and red. An essential signaling device for all survival situations, the ultralight, waterproof UST Hear-Me Whistle emits a shrieking, high-pitched sound and has a pea-less design for all-weather use that won’t rust, clog or freeze. It has a clip that attaches to clothing or other gear and comes with a break-away lanyard for quick access. Weighing just 0.3 ounces (9 grams), it measures 2.75 x 0.75 x 0.75 inches (70 x 19 19 mm). It's backed by a two-year manufacturer's limited warranty. UST Brands has been manufacturing camping, survival, personal safety, and emergency preparedness equipment for over 80 years, including innovative LED lights, all-weather fire starters, premium outdoor cutting tools, camp kitchen products, first aid kits, unbreakable signal mirrors, and more. Keep just about everything you may need for an emergency around your neck when you have the Coleman 5-In-1 Survival Whistle. Blow the whistle if you're lost on the trail or need medical help; the signaling mirror will show rescue crews where you are. Even when there's no reason to worry, the compass helps you find your way and the waterproof matchbox with fire-starter flint ensures a campfire is just a strike away. Great kit for camping or emergencies. Don't be caught in the wilderness without one! Cleverly designed and very functional for many purposes. It comes apart with a twist of the easy to see locking mechanism which is a push together and twist about a 1/4 turn, and the same for the magnifier. The needle is very sensitive and if the needle is not in balance, all you have to do is tap the side of the casing to get the needle to move. The Pencil Grip Keychain Wrist Coil with Whistle features a metal key ring that holds a sufficient number of keys that need to be kept handy. This high quality assorted tri-color wrist coil of this keychain consistently stretches to fit any arm and always returns to its original shape and size. 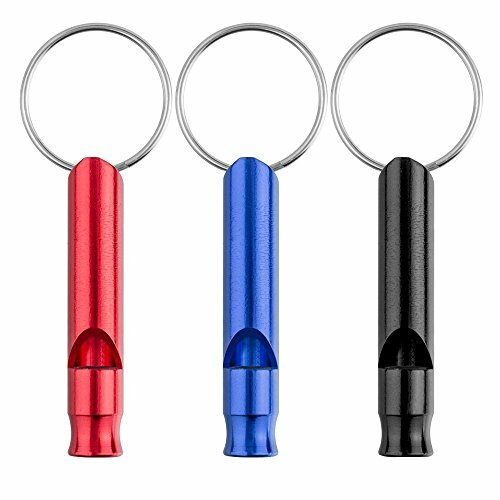 This keychain comes with a non-toxic high quality metal whistle that can be used for sports activities safety alerts attention and security emergencies. 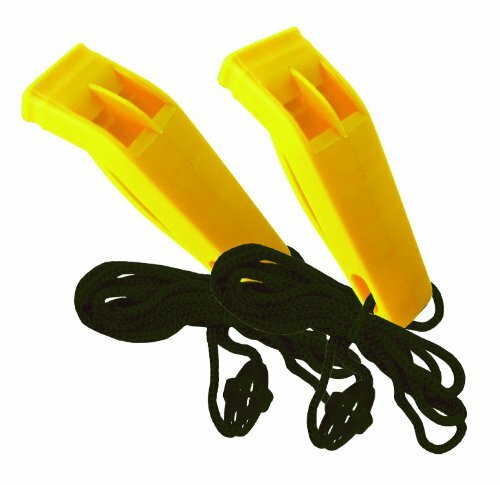 The Aqua Marine Rescue Whistle is powerful, rugged and reliable. Designed for extreme conditions in the toughest marine environments this whistle is suited for any environment. Made from high-impact, heavy duty plastic,. There are no metal or moving parts to break or corrode. The ultra-loud, two chamber design allows for the highest sound possible. 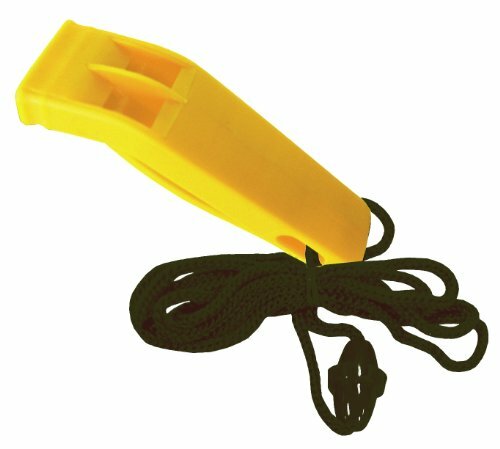 The built-in clip allows for placement virtually anywhere and with the lanyard hole you can strap this whistle to any piece of gear. Perfect for the track coach, swim coach and everyone that ventures outdoors. We hope you'll never need to use it, but in an emergency you're sure to know it works. 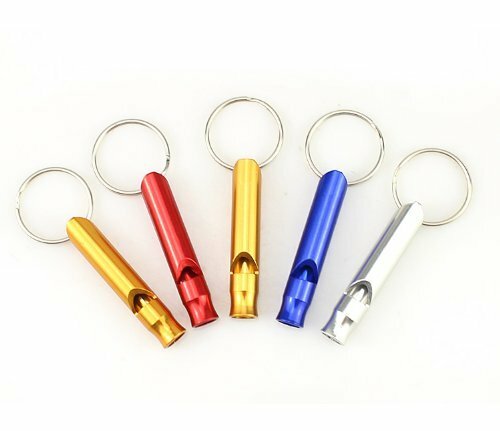 Vastar Aluminum Whistle Key Chain is a Very Nice Aluminum Emergency Survival Whistle Key Chain, fit for outdoor activity, camping, fishing, hiking, traveling, etc.! Loud whistle can be heard for far distance and brightly colored can easy to be found when you need it. Package included: 3 x Aluminum Whistle Attention: The whistle is for Emergency Hiking Camping Survival, not a toy minimun age above 6 years old . Warranty: 45 days money-back & 18-month warranty. Any questions you have, please don't hesitate to contact us. We will get back to you within 24 hours. 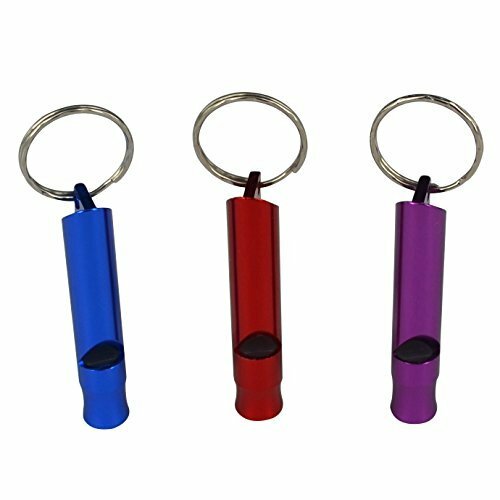 Emergency safety whistle keychain is great for any situation and it lets out quite a blast. Great for boating, camping, hiking personal safety, and geocaching. The Hear-Me Whistle emits a shrill, high-pitched sound so you can be found in an emergency situation. Two year limited warranty.